A disputed BuzzFeed News report and more misstatements from President Donald Trump’s attorney have muddied the waters on what did and did not happen with the business deal in Russia. The deal has surfaced as a key episode in the Russia investigation with court records revealing that Trump pursued it during the 2016 campaign while the Kremlin was directing a large-scale influence operation aimed at swaying the election his way. — January 2016: Cohen emails the office of Kremlin spokesman Dmitry Peskov asking for help getting the Trump Tower Moscow project off the ground. He then has a 20-minute phone call with one of Peskov’s assistants about it and asks for help “in securing land to build the proposed tower and financing the construction,” according to court papers. A person close to the Trump Organization says the company’s email traffic about the project drops off this month. — June 9-14, 2016: Cohen and Sater exchange several messages about the Trump Tower Moscow project and Cohen’s travel to Russia. — June 14, 2016: Cohen meets with Sater in the lobby of Trump Tower and tells him he would not be traveling back to Russia “at that time.” This is the same day the Democratic National Committee announces that its computer networks were penetrated by Russian hackers. 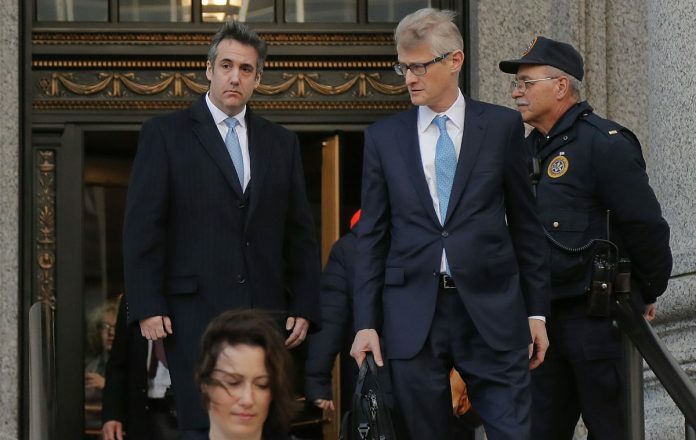 — Jan. 20-21, 2019: Trump lawyer Rudy Giuliani suggests in TV interviews that Trump remembers conversations with Cohen about the project “up to as far as October, November,” or right up until the election. That would have extended the timeline for the Russian business deal well beyond what the president has publicly acknowledged. Giuliani also leaves open the possibility that Trump and Cohen might have discussed Cohen’s testimony. The next day, Giuliani walks back his comments, saying they “did not represent the actual timing or circumstances of any discussions.” He says his comments were “hypothetical” and “not based on conversations” he had with the president.